Timeless. Nostalgic. Romantic. Eclectic. Classic. Fun. Studious. Antique. Whimsical. Colorful. 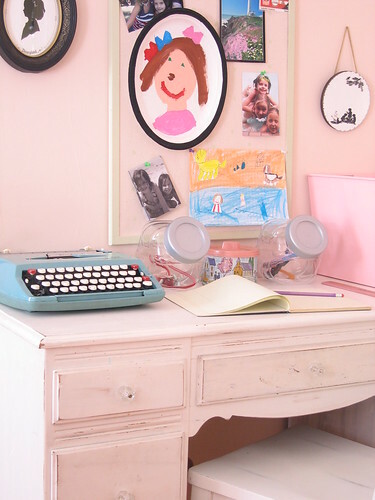 Whatever the make, model, or color... A typewriter can add that little extra something to a room. 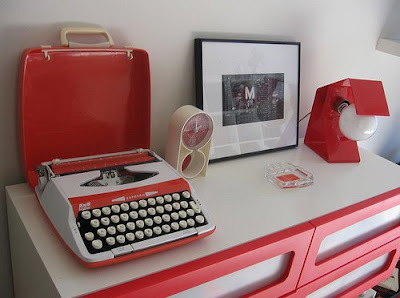 Here's a photo collection of typewriters incorporated into home decor. Photo from a house tour featured in Country Living. "Making An Entrance" post at Porch Light Interiors blog. 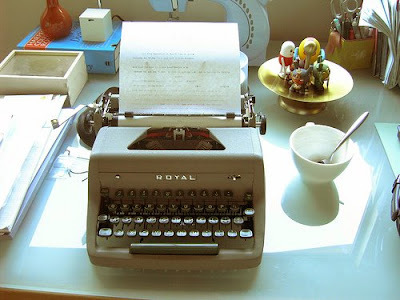 "Vintage Friday: Typewriter Part II" post at Luphia blog. Flickr: hellobluebrown's photo displaying miscellaneous antiques. Flickr: rachelluttrell's photo of a no-fuss workspace. Flickr: Elly Zee's photo of Earnest Hemingway's study. Flickr: Greater Yesterday's photo of her bedroom dresser. "Girls Day" post at ShopTalk blog. I collect vintage typewriters, btw. (Three now to date.) I'd love to find a way to incorporate one of them into my apartment decor this fall, but space will be limited so I may have to leave them behind. Wow!!! I just discovered your blog, and I fell in love with it! You have from now on a new Spanish follower!!! I have mine (a beautiful green one, with case)dispayed on top of my kitchen cabinets with some other eclectic finds. Loving these. We are doing my daughter's nursery with a literary/typewriter theme and these are helping me get inspired.